Your Harley deserves LED illumination with pure style set by Radiantz. 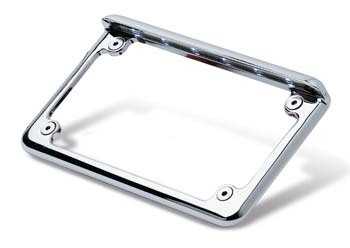 We're proud to manufacture and sell V-Rod Muscle number plate parts and components. Send a message with incredibly bright brake and turn lights found right on your license plate frame. Our stock fits your Harley like a glove. Stay safe out there with our warranty-backed V-Rod license plate light. Our LEDs offer both yellow and red hues, depending on the selected mode. Enjoy our patented Z-Flex LED array that can be seen across hundreds of feet. If you're looking for a more simplistic design, consider V-Rod number plates with an overhead light. Illuminate your plate's numbers so that you're compliant with local laws. Radiantz has been in business for 20 years, so we know why street legal is the most important word in your vocabulary. Outfit your Harley, hit the road and never look back with our LEDs lighting your way.